My hero is Shawn Dunham. Shawn served in the U.S. Marines during Desert Storm (93-94), and at the age of 35, re-enlisted in the U.S. Army, where he served from 2007- 2013. 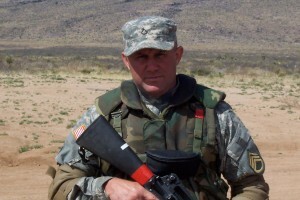 He was assigned to the 3rd Armored Cavalry (Fort Hood, Tx) and served in Mosul, Iraq and Al Diwaniyah, Iraq. His primary MOS was 74D-Chemical, Biological, Radiological and Nuclear Specialist. Shawn was honorably discharged as 100% disabled due to PTSD and injuries (including TBI) he survived from several IED incidents. Since leaving the military, he works to express his emotions through music, learning to write lyrics that help bring healing to other combat soldiers, and those veterans dealing with PTSD and the effects of returning home. Shawn works diligently with non-profit organizations who work with soldiers through music therapy and songwriting. A day doesn’t go by that we don’t give thanks for his service in the military, but that he was able to come home. Each and every day, Shawn proves that you are who you decide to be – not what has happened to you in life. He is no stranger to hard work and his faith, determination, work ethic, humor, generosity, adventurous spirit, and kind heart are just a few of the reasons that make him our hero. Be sure and check out Heroes and Horses on Facebook, Instagram and their website!